They're mad as hell and they're not going to take it anymore. A loose coalition of conservative activists plan to boycott Facebook on July 4 to protest what they consider unfair treatment from the social network. 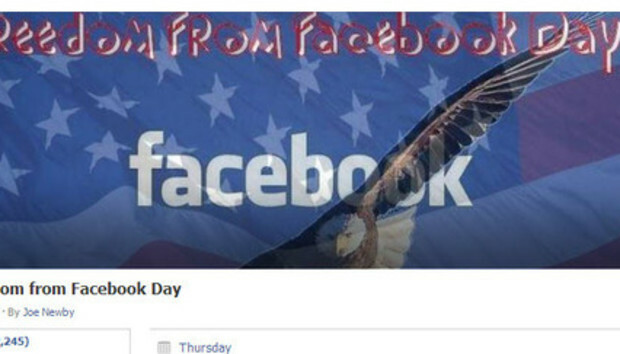 Idaho blogger and Examiner.com columnist Joe Newby created the "Freedom from Facebook" event--on Facebook, obviously--to gather conservatives in a day-long protest against the social network. On the event's page, Newby posted several articles describing instances where Facebook has deleted content or banned conservative activists while leaving threats of violence against Sarah Palin and George Zimmerman intact. Conservative blogger Julia Sieben told the Daily Beast that Facebook is biased against users on the right because of founder Mark Zuckerberg's immigration lobbying efforts. "They are all about putting forward Obama's liberal agenda," Sieben told the Beast. Sieben said U.S. media outlets have to remain unbiased to avoid sliding into Hitler-style propaganda-mongering--of course, Facebook is not a news organization and is not held to the equal time rule that applies to politicians on news broadcasts. Facebook is also not a government branch and can censor whatever they feel like censoring. But the site isn't censoring conservatives, a Facebook spokesperson said. Sarah Feinberg told The Daily Beast that the social network's moderators review more than a million reports a week about content complaints, and "occasionally make a mistake." "I'm always surprised that both sides of the political divide are always convinced that the individual mistakes that our reviewers make stem from partisanship, but I suppose I shouldn't be by now," Feinberg told the Beast. "The mistakes that we make are in fact human error." More than 2,000 conservatives disagree--that's how many people have confirmed their attendance on Facebook. « How customizable can the Moto X possibly be?